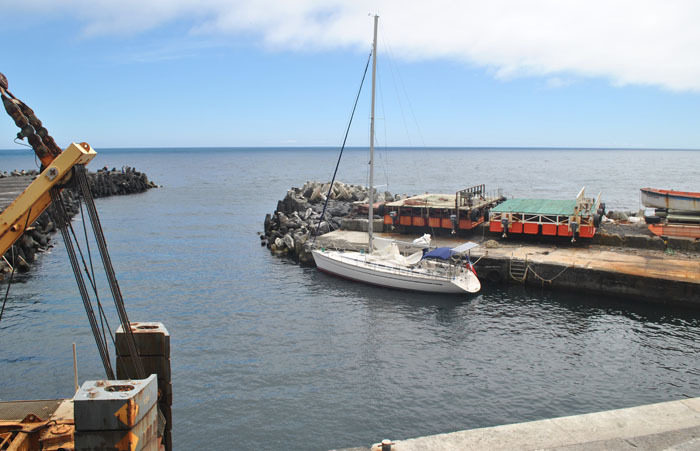 On the 4th January 2019, we had a surprise visit from the yacht Faustin's Dream, which is based in Réunion. 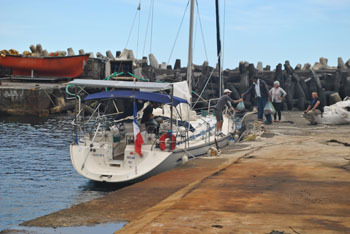 She was en route from Brazil to Cape Town, and following sail damage a few days ago was looking for a safe anchorage to make repairs and take on water, diesel and other supplies. The yacht had tried to radio in advance but unfortunately could not make contact. 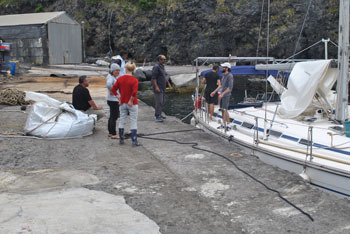 It was not until our visiting contractors went to the harbour at 06:30 that we knew the skipper had taken a risk by coming into the harbour, which is forbidden for safety reasons. She was fortunate that she did not run aground, and thankfully conditions were perfect, but as we all know, these can change very quickly. They crew then made their repairs, called family and were on their way by 15:00. Thanks to all who came and helped on their day off; Jack Green, Conrad Glass, Samantha Swain, Andrew Green and Dawn Repetto. Yacht Faustin's Dream moored in Calshot Harbour. If you were on Faustin's Dream, we'd appreciate your feedback using our Visitors' Feedback Form.